A small area of modern Pembrokeshire lying within the parish of Bosherston. During the medieval period, Bosherston was a manor comprising 1 knight’s fee held of the Lordship and Earldom of Pembroke, a heavily Anglicised region that was brought under Anglo-Norman control before 1100, re-organised along English manorial lines and never retaken by the Welsh. Until the 16th century the manor was known as Stackpole Bosher. The Stackpole element may be of Scandinavian origin, derived from ‘stack’ or rock, indicating that the area was known – and perhaps even settled – by Norse seafarers during the later early medieval period. The nameis shared with neighbouring Stackpole Elidor. The ‘Bosher’ suffix derived from the family name of the lords of the manor, and was first recorded in 1247 when Philip Bosher held the manor. The present settlement appears to have been an agricultural vill established around the church. It is a very loose nucleation and exhibits no evidence of planning. The church has a circular churchyard, later extended, which in this area of early Anglo-Norman settlement suggests that it may be a pre-Conquest foundation. The shape of the surrounding enclosures suggests that they represent later enclosure of medieval open fields. However, it has been suggested that the extensive system of north-south, narrow fields in the Castlemartin peninsula, to the west of the character area, has its origins as a bronze age co-axial field system. 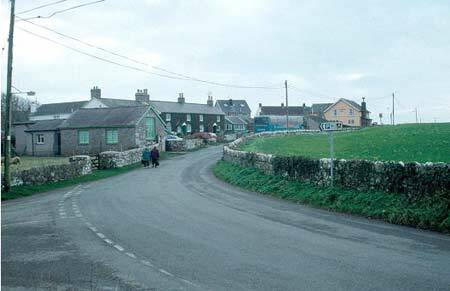 It may be that this system extended into the Bosherston character area and has been variously adapted and altered during the medieval an later periods. Farmsteads had been established at Buckspool and Trevallen by c.1600, indicating that the process of enclosure had begun by this date. The manor was still in Bosher hands in the late 16th century, but was acquired by the Lorts of Stackpole Court during the 17th century and passed to the Campbells of Cawdor in c.1700. Estate maps of the late 18th century, and the tithe map of 1839, show a landscape very like that of today. Thornston farm had been established by 1793, but there has been little subsequent development, even within Bosherston village. The southern edge of the character area is represented by the boundary with Castlemartin Range, acquired by the MoD in 1939 and established as an artillery range. 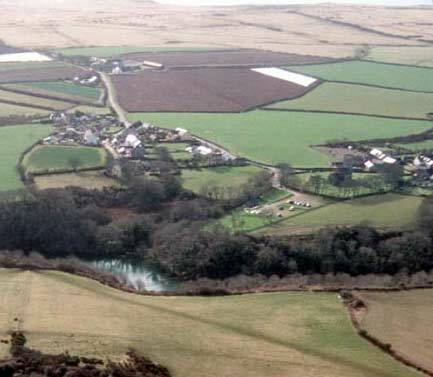 The small but nevertheless distinct historic landscape character area of Bosherston lies on a plateau at about 40m above sea level to the west of the parkland of Stackpole Court, and close to the coast. It is essentially an agricultural landscape (although now with a strong tourist element) with a small village and dispersed farms. Land-use is a mixture of improved pasture and arable. It is a windswept landscape, exposed to the prevailing westerly winds from the Atlantic and consequently there are few trees and little woodland apart that from close to the village and in sheltered hollows, although the steep valley sides of the neighbouring area of Stackpole Court are heavily cloaked in deciduous woodland. Hedges where present are low and windswept. Fields are relatively small and irregular; with the strip-shape of some indicating that they have evolved from a former open field system. Stone-faced banks and earth banks are present (sometimes with hedges), but mortared limestone walls, both in the village and fields, are characteristic of this landscape. The use of local limestone is also a characteristic component of the buildings from the medieval church to 19th century farm buildings. Bosherston village comprises a loose cluster of buildings with the imposing medieval church of St Michael and All Angels’ at its core. Secular buildings in the village mainly date to the late 18th century and early 19th century and are in the formal Georgian style, such as the Old Rectory and Schoolroom Wing, or exhibit estate influenced architecture, such as a pair of cottages, now a café. An estate architectural signature is strong in Bosherston, and it would seem that most of the older buildings were built, or rebuilt, by the Stackpole Estate in the 18th century and 19th century. Some modern houses and bungalows in a variety of styles and materials are intermixed with the older dwellings. Outside the village some houses are in the vernacular tradition, with possible pre-18th century elements. Farm buildings are substantial, of several ranges, stone built and probably 19th century. 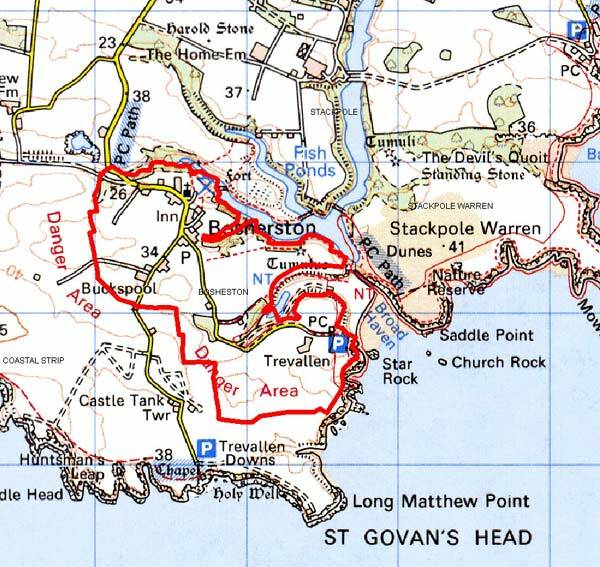 A good deal of tourist traffic passes through the area on the way to car parks at Broad Haven and St Govan’s Chapel and low-level tourist facilities such as a car park, a café and toilets are provided for visitors. Recorded archaeology includes the sites of several abandoned cottages and farmsteads. This is a distinct and well-defined historic landscape character area. It has quite clear hard-edged boundaries as it is bordered by a military firing range to the south and west, by a tract of wind-blown sand to the east and by Stackpole Court Park and Gardens to the north.